Would you pit your skills against 22 other student teams to show that you have what it takes? The MBSSA Case Competition encourages students to combine their classroom learnings with soft skills in an intensive 11-day challenge. Many students say that studying at Melbourne Business School (MBS) is tough, but that this has instilled a certain discipline and drive in them that more often than not, sees them seek out challenges in a number of arenas both inside and outside the classroom. 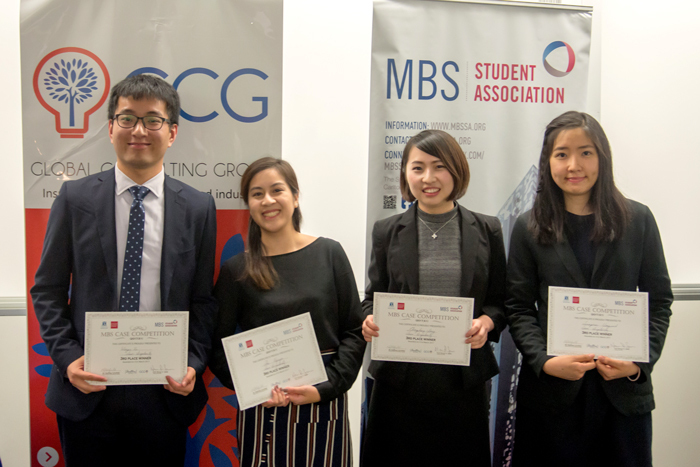 For some, taking part in the recent Melbourne Business School Student Association (MBSSA) Case Competition is one such way to test their mettle and merits amongst their peers. In this particular session, 22 student teams were presented with a business case to solve in just under two weeks. The request: Develop an internationalisation strategy for a hypothetical top-tier China-based advisory company. Teams had to provide strategies for expansion into western countries, with a mission for the firm to become a market leader by 2020. Some of their strategic considerations included target destinations (i.e. Europe, US and Australia), market entry methods, cost of investment, cultural conflicts, and regulatory and operational risks. 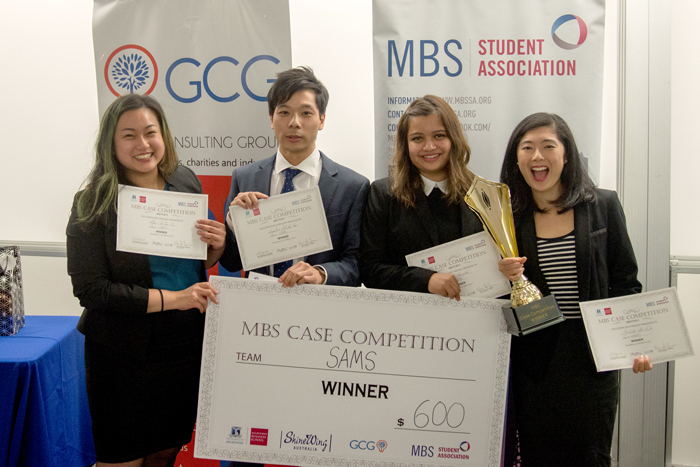 We sat down with winning team, Team SAMS (Alexis Lee, Shreya Kamerkar, Michelle Tan, and Sapphire Chen) and Team Singularity (Stephanie Deng, Diana Nguyen, Tanaporn Wongwanich and Johnson Xu), who took out 3rd place, to find out what it was like. Why were you interested in taking part in the case competition? I have always had a passion for management consulting, which motivated me to give it a try. I also regard it as a great opportunity to adapt the knowledge I have learnt from university and to utilise my research skills when solving a problem, within a limited timeframe. I also really enjoy working with other people to learn new things; the context of working in a team was another point that drew my interest. I wanted to make the most out of my final semester and make it memorable. I also wanted to see how much I have progressed and learnt throughout my studies. I was excited at the prospect of being able to apply all the different concepts and frameworks on a tangible project such as a case competition. What were the main challenges, and how did you overcome them? We had limited access to the information of the case company, and that resulted in a lot of time being spent on research. It was very difficult for us to make assumptions and provide recommendations to solve the case issues. In order to simplify these challenges, we delegated the tasks according to each member's’ strengths. We then gathered any information that was deemed useful, and discussed as a team, before coming to decisions. Ultimately, this also created a friendly environment and encouraged us to work efficiently and effectively. SAMS – congratulations on winning the competition! Tell us your suggested plan of action to the panel; what made you stand out? Our plan was to show that we were comfortable and well-prepared with the subject matter. Towards the finals, we put in extra preparation with relevant analyses in the appendices to be able to give data-backed responses to their questions. We also decided to improve on our presentation by highlighting more feasibility aspects of our recommendations after gaining individual feedback from preliminary round judges. Yes, ultimately, we were praised for our due diligence. We got kudos for design, clarity in solutions, delivering handouts, our clear and effective use of an appendix, and presentation skills. We received positive feedback that included the level of specificity and depth of our solutions; our implementation proposals and final recommendations were more specific than most. Has this experience has helped you in either the rest of your studies or for future jobs? The MBSSA case competition experience helped me understand the importance of the theoretical knowledge that I've gain throughout my academic life, and how to combine these with fine-tuning my soft skills in preparing for a professional career in the future. Integrating a real-world situation into the experience challenged me as a young professional. For example, with limited time for research and brainstorming, we learned essential time-management skills while coming up with high-quality strategies. I feel that the case competition experience has encouraged me to become a more well-rounded person, and has certainly boosted my confidence in taking on future challenges. I completely agree! Overall, it was an insightful week. I was able to gain a true perspective of what a career as a management consultant would look like, and most importantly, I learned how to be more assertive and innovative, and I definitely improved my interpersonal skills through the experience!